Une version en français suit immédiatement dans cet espace. Just as human activities change the face of our planet, the habits of maritime and port city residents have a disproportionate influence on the fate of coastal and marine biodiversity. We already know that what happens to life on Earth will depend on how people live in cities, but for ports, two factors further leverage their impact. First, they are the most significant global trade and transportation hubs, meaning they can influence and regulate key processes with huge implications on biodiversity. 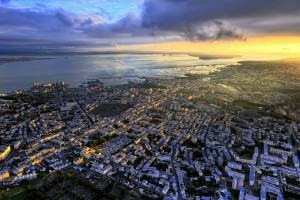 Second, given ongoing urbanization in coastal regions, their urban areas host an increasing population. Thus, their dense populations and high resource consumption patterns can cause offshore and onshore pollution in sensitive ecosystems, but their sustainable governance offers immense opportunities for reducing footprints and set best practices. It is also clear that local authorities in port cities, as managers, mediators, regulators and stewards of their natural capital at the closest level to citizens, can make an enormous difference for the sustainable management of biodiversity and ecosystem services. The successful transfer and adaptation of their different experiences through decentralized cooperation is challenging but critical for the conservation and sustainable use of marine and coastal resources. In this context, the urban community of Brest, France, set up an international network of around 20 coastal territories, local authorities and their scientific partners, in North and Latin America, Europe and Asia, called the Maritime Innovative Territories International Network (MITIN), dedicated to promote and develop “blue growth”, the sustainable economic use of coastal and marine resources, through effective collaboration and exchanges. What can port authorities do? Decision makers in port city governments, however, can further promote awareness on biodiversity-related issues, and can ensure cost-effective freshwater supply and security through the wise use of wetlands and, increasingly, desalination of sea water (with potential impacts on groundwater salinity and energy consumption). Port city governments can enhance food security by supporting sustainable urban and peri-urban agriculture and aquaculture (which will also reduce coastal and marine pollution), and control urban expansion on sensitive coastal habitats via land-use zoning. They can also protect their cities from the impacts of sea level rise and storm surges by preserving the ecosystems which provide resilience to those coasts (such as estuaries, mangroves and coral reefs), can stimulate development in areas less subjected to these risks, and can participate in early warning systems that minimize actual damage by giving residents and officials time to prepare at critical times. By applying the right combination of economic incentives and attracting green investments, port cities can ultimately promote the wise use of their natural marine and coastal resources, while also addressing poverty eradication and the economic development of their citizens. Working with retailers and advertisers, as well as with civil society, and implementing sustainable public procurement guidelines, coastal local authorities can promote sustainable consumption. Fish stocks and fisheries are managed and regulated mostly through subnational and local authorities – even when guidelines and quotas are defined by national governments, the enforcement of no-fishing zones and the monitoring of activities and volumes rely heavily of local agencies and authorities. Port cities also play a crucial role in the prevention, control and eradication of invasive alien species. Shipping can disturb coastal ecosystems by introducing these species through exchange of ballast water and fouling. By establishing treatment protocols for ballast water and ship containers, as well as by introducing biosafety measures, port cities limit the contamination of coastal environment by invasive alien species. Their choices of technologies for urban infrastructure define the ultimate ecological footprint of their cities, their use of regulatory policy tools and voluntary economic incentives can bring greener businesses, and the quality of the urban environment they offer will attract, or not, discriminating citizens to settle, get engaged and pay taxes. Finally, local authorities in ports will contribute in decisive ways to expand global networks of coastal and marine parks — the 193 Parties to the Convention on Biological Diversity agreed to protect 10 per cent of all coastal and marine areas by 2020 through integrated systems of protected areas and other conservation measures as part of Aichi target 11 — we’re at around 6 per cent now and we’ve barely got another 8 years to reach the deadline! 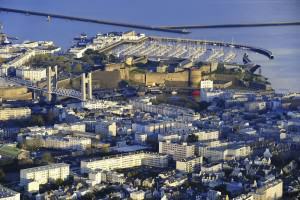 The urban community of Brest is ranked in the world‘s top-10 for science and maritime techonologies, with more than 1,800 researchers currently developing cutting edge work. As France’s main harbour for the Navy’s fleet maintenance and civilian ship repair, the community owns 5 ports, with different functions (military, scientific research, fishing, trade, leisure), and hosts many centres of excellence in scientific and technological research and education, such as IFREMER and Oceanopolis. As such, the local authority of Brest is involved in different European networks, such as the Conference of Peripheral Port Cities and the Conference of Atlantic Arc Cities, promoting maritime issues including marine and coastal biodiversity. At the international level, Brest métropole océane supported the creation of a new network, the Maritime Innovative Territories International Network (MITIN). Officially launched on July 13th 2012, MITIN is an initiative of Brest Science Park (Technopôle Brest Iroise), supported by Brest métropole océane and several international partners of the local authority. Today, MITIN gathers 20 maritime territories represented by their technology poles, development and scientific agencies, and local authorities, including the US (San Diego), Mexico (Veracruz), China (Qingdao, Shangaï), Argentina (province du Chubut), Vietnam (Haiphong), Italy (Tarente), UK (Southampton), Portugal (Porto), Spain (Vigo), and Quebec (Rimouski). The network aims at promoting sustainable “blue“ growth and addresses the sustainable use of marine bio-resources, transportation, maritime safety and security, renewable marine sources of energy, marine instrumentation and information technologies. A web portal has been created to provide virtual spaces for working groups, practical actions and technology transfer. As president of the local authority of Brest, Mayor François Cuillandre also represents port cities in the Sustainable Ocean Initiative, a platform in the Convention dedicated to information sharing on best practices for the achievement of Aichi Targets 6, 10 and 11 related to marine and coastal biodiversity. The needs of each participating city are different, as are the level of expertise, available materials and suppliers of goods and services. One of the most effective ways to address this is the actual exchange of partners, allowing hosts and suppliers to benefit from a different perspective and further building the capacity of all experts involved, who are then able to work in the context of both cities and institutions. Thus, MITIN identifies priorities, including sustainable uses of marine resources, gathers partners and experts on common issues, offers an information-sharing platform and engages practitioners in the exchange of “know-how”. The network can rely on the Summer University, with training sessions suggested by local scientific stakeholders in Brest and supported by Brest métropole océane. MITIN focuses its cooperation on the concept of Blue Economy, adjusting its context to the needs of each stakeholder group and economic actor to facilitate engagements and commitments. For instance, the implementation of marine protected areas taking into account local economic activities has proved to be an efficient mean to protect and restore marine stocks and habitats. In this context, Integrated Coastal Zone Management and Marine Spatial Planning are well-tested policy tools for public authorities to manage the growth of maritime activities, taking into account fragile or rich marine ecosystems. Very few funding mechanisms exist in this domain, limiting the scope and effect of those productive partnerships to the capacity of participating local authorities. In Europe, the Committee of the Regions promotes the role of local actors to develop regions and all around the world some local initiatives are implemented. The involvement of Brest’s international partners through MITIN reveals the interest and capacity of action of local actors in issues that have been considered mostly from a national point of view for a long time. But, to be fully efficient, decentralized cooperation would benefit from the development of international or multilateral funding. We therefore plead in favor of the establishment of more mechanisms, either financed by States or international organizations, for instance based on the model of the European Committee of Regions, not only to promote implementation but also to coordinate the funding and technical efforts of various subnational and local authorities. Regarding new partnerships, it is essential to scale up lessons learned at global level, and to keep doors open for the further engagement of different networks and possible partners. In the case of MITIN, further collaboration between Brest métropole océane, its partner networks and ICLEI – Local Governments for Sustainability, an experienced international network gathering local authorities on sustainable development in urban areas issues, is being examined. To expand its objectives, Brest métropole océane has initiated a partnership with the Secretariat of the Convention on Biological Diversity for technical cooperation and dissemination of experiences to CBD Parties and their subnational and local authorities. 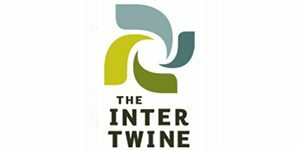 This partnership implies both the involvement of local stakeholders (main organizations working on biodiversity) and the invitation to its international and European networks to commit. 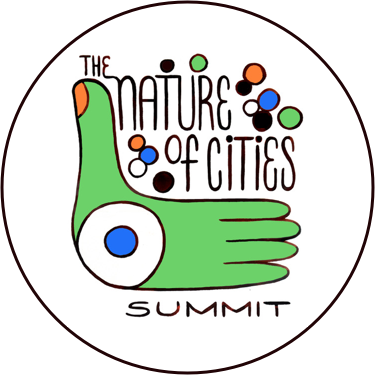 As such, this initiative is a model for thematic and regional networks of local authorities supported by the Secretariat and ICLEI within the Global Partnership on Subnational and Local Action on Biodiversity, which also includes the Mediterranean network MediverCities supported by Montpellier. Similarly, this partnership will benefit from the technical support of ICLEI and its pioneering Local Action on Biodiversity programme as a global source of expertise in local governance of biodiversity. Two events, initiated by MITIN members, and supported by Brest métropole océane, will take place this year: a specific workshop organized by the State of Veracruz dedicated to environmental issues in the Gulf of Mexico in September 2013 and, at the end of October, the city of Qingdao (China) will host a Conference on “Blue Economy”, an innovative approach to the management of human production and consumption patterns and the efficient use of natural resources and energy through the use of nature-inspired technologies and solutions that are environmentally beneficial and have wider financial and social benefits. In 2013, Brest métropole océane will also offer to its partners the possibility to attend a summer school university on site. Finally, Brest and the Secretariat of the Convention on Biological Diversity plan to cooperate on the production of a more detailed study on the role of port cities on marine and coastal biodiversity, building on the recently published Cities and Biodiversity Outlook. Tout comme les activités humaines modifient le profil de la planète, le comportement des habitants des villes portuaires et côtières a une influence disproportionnée sur le sort de la biodiversité marine et côtière. Nous savons déjà que ce qui arrive à la vie sur terre dépendra de la manière dont les populations vivent en ville, mais pour les villes portuaires, deux facteurs augmentent leur impact : d’abord, elles sont des plaques tournantes incontournables du transport maritime et du commerce international (ce qui signifie qu’elles peuvent influencer et réguler les principaux processus qui ont d’immenses implications sur la biodiversité) ; ensuite, du fait d’une urbanisation croissante dans les régions côtières, leurs zones urbaines doivent faire face à une population grandissante. Ainsi leurs populations denses et leur modèle de consommation élevée de ressources est une cause de pollution marine et terrestre pour les écosystèmes sensibles des zones littorales, mais leur gestion durable offre d’immenses opportunités pour réduire leur empreinte et mettre en place de bonnes pratiques. Il est certain que les autorités locales des villes portuaires, en tant que gestionnaires, médiateurs, régulateurs de leur capital naturel, au plus proche des citoyens, peuvent faire une énorme différence pour une gestion durable de la biodiversité et pour les services écosystémiques. La réussite du transfert et de l’adaptation de leurs différentes expériences à travers la coopération décentralisée est un défi ambitieux pour la conservation et l’utilisation durable des ressources marines et côtières. Dans ce contexte, la Communauté Urbaine de Brest, en France, a mis en place un réseau international regroupant une vingtaine de territoires côtiers, d’autorités locales ainsi que leurs partenaires scientifiques, d’Amérique du Nord et du Sud, d’Europe, d’Asie, appelé Réseau International des Territoires Maritime Innovants (RITMI). Ce réseau est dédié à la promotion et au développement de « l’économie bleue », l’utilisation et exploitation durable des ressources marines et côtières, au travers d’une collaboration et d’échanges de bonnes pratiques. Que peuvent faire des autorites portuarires? Les compétences et les bonnes pratiques des autorités locales en ce qui concerne la biodiversité ont été largement détaillées sur ce blog et dans le programme innovant « Les villes et les perspectives de la biodiversité (VPB) », lancé lors de la dernière Conférence des Etats Parties de la Convention qui s’est tenu à Hyderabad, en Inde en octobre 2012. Cependant, les élus de villes portuaires peuvent promouvoir davantage la sensibilisation sur les enjeux de biodiversité et peuvent assurer l’approvisionnement en eau douce et sa sécurisation via une utilisation raisonnée et rationalisée (coût-efficacité) des zones humides et le recours de plus en plus fréquent au dessalement de l’eau de mer (avec des impacts potentiels sur la salinité des eaux souterraines et la consommation d’énergie). Les villes portuaires peuvent garantir la sécurité alimentaire en soutenant une agriculture et une aquaculture urbaines et périurbaines (ce qui réduira également la pollution marine et côtière) et contrôler l’étalement urbain dans les zones sensibles d’habitats côtiers via des plans d’occupation des sols (Plan Local d’Urbanisme en France). Elles peuvent également protéger leurs territoires des impacts de l’élévation du niveau de la mer et de l’augmentation des tempêtes en préservant les écosystèmes qui apportent la résilience nécessaire à ces côtes (telles que les estuaires, les mangroves et les récifs coralliens). Elles peuvent favoriser le développement de zones moins sensibles à ces risques et peuvent participer à la mise en place de systèmes d’alerte préventifs qui permettent de minimiser les dégâts en donnant aux habitants et aux élus le temps de se préparer. En développant un bon équilibre entre incitations économiques et en attirant les investissements durables, les villes portuaires peuvent promouvoir l’utilisation raisonnée des ressources marines et côtières, tout en apportant des solutions pour réduire la pauvreté et favoriser le développement économique local. En travaillant avec les commerçants,les publicitaires et la société civile, et en mettant en œuvre des mesures de développement durable dans le cadre des marchés publics, les autorités côtières peuvent promouvoir un mode de consommation durable. Les stocks de poissons sont principalement gérés et régulés par les autorités infranationales et locales – même lorsque les orientations et quotas sont définis par les gouvernements nationaux, l’application plus stricte des zones interdites à la pêche et la gestion des activités et des volumes dépendent fortement des autorités locales. Les villes portuaires ont également joué un rôle essentiel dans la prévention, le contrôle et l’éradication des espèces invasives. Le transport maritime peut perturber les écosystèmes côtiers en introduisant ces espèces lors du déversement des eaux de ballast et des salissures. En établissant des procédures de traitement des eaux de ballast et des containers des navires, en introduisant également des mesures de sécurité biologique, les villes portuaires limitent la pollution de l’environnement côtier par les espèces invasives. Leurs choix de technologies pour les infrastructures urbaines définissent l’empreinte écologique finale de leur territoire, le recours à des outils d’aide à la décision et des mesures d’incitations économiques, peuvent favoriser des économies plus durables, et la qualité de l’environnement urbain qu’elles offriront sera susceptible d’attirer une partie de la population prête à s’engager et à contribuer à l’effort commun. Au final, les autorités locales portuaires contribueront de manière décisive à étendre les réseaux internationaux de parcs marins et réserves littorales – les 193 Etats Parties de la Convention sur la Diversité Biologique se sont entendus pour protéger 10 % de l’ensemble des zones côtières et marines d’ici 2020 par l’instauration de zones protégées et autres mesures de protection précisées par l’objectif 11 d’Aïchi – la barre des 6 % est à peine franchie et il ne reste que 8 années pour atteindre cet objectif ! La Communauté urbaine de Brest figure parmi les 10 premières places mondiales en sciences et technologies de la mer, comptant plus de 1 800 chercheurs menant des travaux d’excellence. En tant que principal port français de réparation navale civile et militaire, le territoire est doté de 5 ports aux fonctions différentes (militaires, recherche scientifique, pêche, commerce, plaisance), et héberge de nombreux centres d’excellence dans le domaine de l’éducation et de la recherche scientifique et technologique, tels qu’Océanopolis ou IFREMER. L’autorité locale de Brest est partenaire de différents réseaux Européens, comme la Conférence des Villes Portuaires Périphérique (CVPP), la Conférence des Villes de l’Arc Atlantique (CVAA), pour promouvoir les enjeux maritimes y compris la biodiversité marine et côtière. Au niveau international, Brest métropole océane a soutenu la création d’un nouveau réseau, le Réseau International des Territoires Maritime Innovants (RITMI). Officiellement lancé le 13 juillet 2012, RITMI est une initiative du Technopôle Brest Iroise, avec l’appui de Brest métropole océane et de plusieurs territoires internationaux partenaires. Aujourd’hui, RITMI rassemble 20 territoires maritimes représentés par leur technopôle, agence de développement, organismes scientifiques et autorités locales. Il comprend : les Etats-Unis (San Diego), le Mexique (Veracruz), la Chine (Qingdao, Shangaï), l‘Argentine (province du Chubut), le Vietnam (Haiphong), l‘Italie (Tarente), la Grande-bretagne (Southampton), le Portugal (Porto), l‘Espagne (Vigo), et le Quebec (Rimouski). Le Réseau a pour objectif de promouvoir une « croissance bleue » durable et aborde l’utilisation raisonnée des bio-ressources marines, du transport maritime, de la sécurité et sûreté maritimes, des énergies marines renouvelables, de l’instrumentation marine et des technologies de l’information. Un portail Internet a été créé pour mettre à disposition différents espaces virtuels pour les groupes de travail du Réseau, et pour faciliter le développement d‘actions concrètes et le transfert de technologies. En tant que Président de Brest métropole océane, le Maire de Brest François Cuillandre représente également les villes portuaires au sein de l’Initiative pour un Océan Durable, plateforme de la Convention sur la Diversité Biologique dédiée au partage de l’information sur les bonnes pratiques permettant d’atteindre les objectifs d’Aïchi 6, 10 et 11 en lien avec la biodiversité marine et côtière. Alors que RITMI vient d’être créé, on peut d’ores-et déjà tirer quelques leçons de son expérience passée, permettant de mieux orienter les activités futures. Les Rencontres Internationales sur la biodiversité marine et côtière, organisées par Brest métropole océane en novembre 2012, a représenté une excellente opportunité pour les réseaux partenaires de Brest, y compris RITMI, présentant les principales caractéristiques d’une coopération décentralisée efficace. A travers le monde, les villes portuaires doivent faire face à des problématiques similaires, cependant, le contexte culturel et institutionnel varie, c’est pourquoi l’échange d’expérience nécessite une implication égale des deux parties. Les besoins de chaque territoire impliqué sont différents, tout comme le sont le niveau d’expertise, l’équipement disponible et les fournisseurs de biens et services. Une des façons les plus efficaces d’aborder cela est un échange effectif entre les partenaires, permettant aux fournisseurs et aux bénéficiaires de tirer profit d’une perspective nouvelle et d’augmenter ainsi la capacité de tous les experts impliqués, qui sont alors capables de travailler dans le champ des deux villes et institutions. Ainsi, RITMI identifie des priorités, incluant une exploitation durable des ressources marines, rassemble des partenaires et des experts sur des problématiques communes, offre une plateforme d’échange d’information et permet l’engagement des professionnels à échanger les savoir-faire. Le réseau peut s’appuyer sur une Université d’été, avec des sessions de formation suggérées par les acteurs locaux scientifiques de Brest et soutenues par Brest métropole océane. Des propositions qui doivent systématiquement être orientées vers l’action et doivent être pertinentes pour chaque partenaire. RITMI concentre ses coopérations sur le concept de l’« économie bleue », adaptant son contexte aux besoins de chaque groupe d’acteurs locaux afin de faciliter son engagement. Par exemple, la mise en œuvre de zones marines protégées prenant en compte les activités économiques locales a prouvé son efficacité pour protéger et restaurer les habitats et les réserves marines. Dans ce contexte, la gestion intégrée des zones côtières et l’aménagement de l’espace marin sont des outils testés au service des autorités locales pour gérer le développement des activités maritimes, en prenant en compte les écosystèmes marins riches ou fragiles. La mise en place de mécanismes de financement international/multilatéral et plus flexible au service de la coopération décentralisée. Très peu de mécanismes de financement existent dans ce domaine, limitant l’étendue et les effets de ces partenariats productifs à la capacité des organisations impliquées. En Europe, le Comité des Régions vise à promouvoir le rôle des acteurs locaux pour développer les régions et des initiatives locales sont mises en œuvre à travers le monde. L’implication des partenaires internationaux de Brest via RITMI révèle l’intérêt et la capacité de l’action des acteurs locaux sur des problématiques qui ont presque uniquement été envisagée d’un point de vue national pendant de nombreuses années. Mais, afin d’être toujours plus efficace, la coopération décentralisée, devrait bénéficier du développement des financements internationaux ou multilatéraux. C’est pourquoi, nous plaidons pour la création de plus de mécanismes, financés soit par les Etats, soit par les organisations internationales, basés, par exemple, sur le modèle du Comité des Régions, non seulement pour promouvoir la mise en œuvre mais également pour coordonner les efforts techniques et financiers d’autorités infranationales et locales. En ce qui concerne la perspective de nouveaux partenariats, il est essentiel de faire remonter au niveau international les expériences locales et de garder la porte ouverte à l’engagement de différents réseaux et partenaires. En ce qui concerne RITMI, la possibilité d’une plus grande collaboration entre Brest métropole océane, ses réseaux partenaires et ICLEI – Les Gouvernements Locaux pour le Développement Durable, un réseau international expérimenté rassemblant des autorités locales sur la problématique du développement durable des zones urbaines – est actuellement étudiée. Afin d’étendre ses objectifs, Brest métropole océane a initié un partenariat avec le Secrétariat de la Convention sur la Diversité Biologique pour une coopération technique et une diffusion des expériences aux Etats Parties de la CDB et de leurs autorités infranationales et locales. Ce partenariat prévoit, à la fois, l’implication des acteurs locaux (principales organisations abordant la biodiversité) et une invitation à ses réseaux européens et internationaux à s’engager. Ainsi, cette initiative constitue un modèle de réseau thématique et régional d’autorités locales, soutenu par le Secrétariat et ICLEI, dans le cadre du Partenariat mondial sur l’action infranationale et locale sur la biodiversité, qui inclut également le réseau méditerranéen MediverCities, soutenu par Montpellier. De même, ce partenariat bénéficiera du soutien technique d’ICLEI – Les Gouvernements Locaux pour le Développement Durable et de son programme innovant « Action Locale pour la Biodiversité », comme source mondiale d’expertise dans la gestion locale de la biodiversité. Deux événements, initiés par les membres de RITMI, et soutenus par Brest métropole océane, se dérouleront cette année : un atelier organisé par l’Etat de Veracruz et portant sur les problématiques environnementales du Golfe du Mexique en septembre 2013 et, à la fin du mois d’octobre, la ville de Qingdao (Chine) accueillera une conférence sur « l’économie bleue », une approche innovante pour la gestion de la production humaine,des habitudes de consommation, une utilisation efficace des ressources naturelles et de l’énergie par le développement de technologies inspirées de la nature et des solutions aux nombreux bénéfices sur le plan environnemental, économique et social. En 2013, Brest métropole océane offrira également à ses partenaires la possibilité de participer à une université d’été. Enfin, Brest et le Secrétariat de la Convention sur la Diversité Biologique projettent de coopérer pour produire une étude détaillée sur le rôle des villes portuaires sur la biodiversité marine et côtière, basée sur la récente publication « Les villes et les perspectives de la biodiversité». Oliver Hillel has been a Programme Officer at the Secretariat of the Convention on Biological Diversity (SCBD, administered by the United Nations Environment Programme) in Montreal, Canada, for the last 6 years. He is responsible for the issues of South-South cooperation, sub-national implementation (involvement of States, Regions and cities), Sustainable Tourism, and Island Biodiversity. Oliver Hillel has been a Programme Officer at the Secretariat of the Convention on Biological Diversity (SCBD, administered by the United Nations Environment Programme) in Montreal, Canada, for the last 6 years. He is responsible for the issues of South-South cooperation, sub-national implementation (involvement of States, Regions and cities), Sustainable Tourism, and Island Biodiversity. 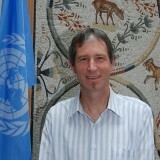 A biologist with a master’s Degree in Environmental Education and MBAs on Managerial Accounting and Hotel Management, Oliver has over 24 years’ experience on international cooperation and negotiations on sustainable tourism, event organization, and training and capacity building programs across many themes and issues related to sustainable development. Previously, he was the team leader for a tourism development cooperation project in the Philippines, Tourism Programme Coordinator for UNEP’s Division of Technology, Industry and Economics based in Paris, France, and Ecotourism Program director for Conservation International. He also worked for SENAC, a professional training institution in his home country Brazil, where he created and managed training and consulting services for hotels, restaurants, and theme parks. For the past 6 years, Oliver has coordinated the SCBD’s activities involving cities and subnational authorities, supporting negotiations that led to the adoption of a Plan of Action for Subnational Governments, Cities and other Local Authorities. He has also co-organized more than 15 meetings including three Cities and Biodiversity Summits parallel to meetings of the Conference of the Parties, and produced the Cities and Biodiversity Outlook, a reference publication on the links between urbanization and biodiversity.